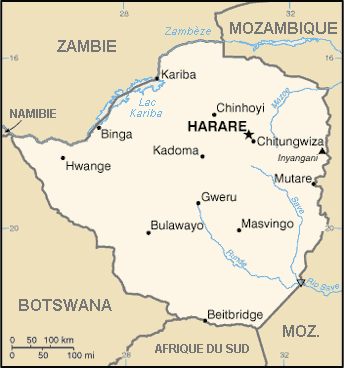 Zimbabwe : When and where to go? The high altitude of the country gives it a mild climate. The rainy season lasts from November to April: This causes high humidity with short but heavy rainfall. The dry season between May and October has sunny warm days cooled by pleasant nights. The inter-seasons are almost nonexistent. The best time to see the wildlife is June, which is a month that is both cool and quiet, enabling you to avoid the high humidity and the tourists from South Africa. To see lush landscapes, the rainy season is more favourable, but you will have fewer opportunities to find animals at the waterholes. Zimbabwe is especially appreciated for its magnificent nature. Harare, the capital, offers various points of interest: The National Gallery with its African works of art, the Harare Gardens, a small tropical forest and many excellent evening concerts of African music. Please note however, there is some insecurity, especially at night. A visit to Victoria Falls is a must: These gigantic falls extend almost 2 km in width; they are amazing to see and hear. A variety of wildlife frequents the area; buffalos, crocodiles, antelopes, lions... An unforgettable discovery. The Hwange National Park has an area of over 14,000 square metres and offers you the opportunity to see a rich diversity of wildlife living amongst vast plains and rolling hills; antelopes, elephants, baboons, as well as jackals, hyenas, leopards, lions. Explore the Great Zimbabwe National Monument: These ruins are the most important historical site in Southern Africa and they are a unique testimony to the Shona’s Bantu civilization between the 11th and 15th centuries. The stone fortress is an extraordinary size, and its location adds a surprising dimension. The Matobo National Park is home to amazingly shaped granite formations, but also numerous and diverse animals. Not to be missed! The easiest way to get to Zimbabwe is by plane, via South Africa. The currency in circulation is the Zimbabwean dollar. The budget required is quite low: You can eat for about €10 in the hotel restaurants, and €1 at the street stalls! If you stay in accommodation such as hostels, it will cost about ten Euros. The entry fees into the parks are reasonable. Regarding health, it is advisable to keep classic vaccinations up to date, especially those against yellow fever, typhoid, hepatitis A and B, and the usual precautions must be observed: Do not drink tap water, wash hands, protect yourself from the sun and mosquitoes, peel fruit and vegetables, do not swim in stagnant water. To travel within the country, there are buses and also flight connections to touristic areas. A bicycle can also be a good solution, but it is not possible to use a bicycle in the national parks.